The message controller reads the values from connected PLC(s), evaluates programmed conditions, and sends to connected marquee(s) messages which satisfy conditions for display. This is all done without making any changes to PLC ladder logic. The TSM Message controller supports a variety of PLC communication protocols allowing it to communicate with most of the popular PLCs available in the market. These include serial protocols like Modbus, DF1, DH485 EZ etc, and network protocols such as Ethernet/IP, Modbus TCP/IP and GE SRTP. The Message controller can drive one or multiple marquees. A single marquee can be driven using a 9-pin RS232 port on the message controller. Multiple marquees can be connected on the Ethernet port, or on serial port using a 232 to 422 converter. 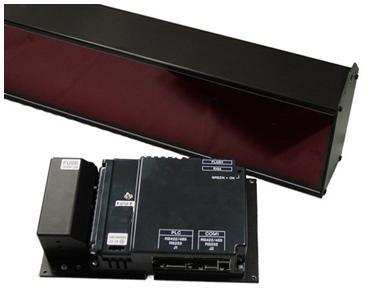 The Message Controller is housed in a compact, industrial grade plastic ventilated housing and is intended for indoor use only. It has a steel back plate with 4 mounting holes that can be used to mount the controller on the rear of the marquee or at a remote mounting panel location.